David Loewen Epp: physician and surgeon; born 11 January 1903 at Laird, Northwest Territories (now Saskatchewan) to David D. P. Epp and Maria (Loewen) Epp. He was the fourth child in a family of five sons and eight daughters, one of which died in infancy. On 6 November 1932 he married Rosella Fischer, daughter of John B. Fischer and Sarah (Stobbie) Fischer at Laird, Saskatchewan. They had two daughters and one son. David Epp died 6 July 1987 in Vancouver, British Columbia. David Epp accepted the Lord in his teen years and upon baptism joined the Laird Mennonite Brethren Church. He was raised on the family farm in Laird. Because he was needed for farm labour, his schooling was interrupted during the war years. However, the delay in his educational plans did not dampen his desire to become a medical doctor. While in his early twenties, he was able to complete his high school at the Rosthern Academy. Then as a mature student, he completed both his Batchelor of Science and medical training at the University of Manitoba, graduating with his MD degree in 1933. After practising medicine in Meecham, Saskatchewan for six months, David and Rosella moved to Coaldale, Alberta. Here he founded the Coaldale Hospital in the midst of a very successful medical practice. Some patients thought so highly of his skills that they refused to consult specialists, even when it was recommended that they should. For instance, one patient needed a delicate eye operation and insisted that David perform the surgery. To prepare for this procedure, Epp acquired the heads of four cows from a Lethbridge slaughter house in order to hone his skills. The operation was a success. In 1947 the Epp family moved to Chilliwack, British Columbia where Epp again took on a busy practice. By this time he had been in contact with Mennonite Brethren Board of Foreign Missions, entertaining the possibility of a service assignment in India. For further preparation, David made his way to New Orleans in 1941 to enrol in a six-month course in tropical medicine. However, owing to World War II, travel to India was not possible. However, in 1952 David and Rosella with their youngest child took on a two-year Mennonite Central Committee assignment in Java. While here he would see as many as 400 patients per day. David Epp had an inquisitive mind and a broad range of interests that included photography, woodworking, and lapidary. He was also a long-term member of the Gideon’s Association. David’s parents were David Epp (21 October 1875, Schoenthal, Manitoba, Canada – 3 November 1963, Clearbrook, British Columbia, Canada) and Maria (Loewen) Epp (10 March 1877, Gnadenfeld, Zagradovka, South Russia – 9 March 1974, Clearbrook, British Columbia, Canada). David’s wife was Rosella Fischer (21 September 1911, Laird, Saskatchewan, Canada – 28 January 2001, Richmond, British Columbia, Canada). Rosella was the daughter of John B. Fischer (5 November 1885, Hillsboro, Kansas, USA – 23 October 1960, Saskatoon, Saskatchewan, Canada) and Sarah (Stobbe) Fischer (27 October 1890, Alexandrovka, Memrik, South Russia – 6 September 1945, Saskatoon, Saskatchewan, Canada). 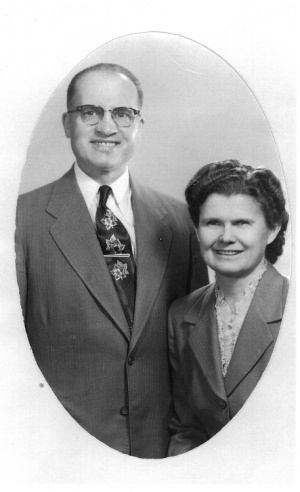 David and Rosella were married 6 November 1932 in Laird, Saskatchewan, Canada and had three children: Lavella, Weldon, and Marion. Epp, Weldon. "Epp, David L. (1903-1987)." Global Anabaptist Mennonite Encyclopedia Online. September 2008. Web. 22 Apr 2019. http://gameo.org/index.php?title=Epp,_David_L._(1903-1987)&oldid=141854. Epp, Weldon. (September 2008). Epp, David L. (1903-1987). Global Anabaptist Mennonite Encyclopedia Online. Retrieved 22 April 2019, from http://gameo.org/index.php?title=Epp,_David_L._(1903-1987)&oldid=141854. This page was last modified on 16 December 2016, at 07:41.